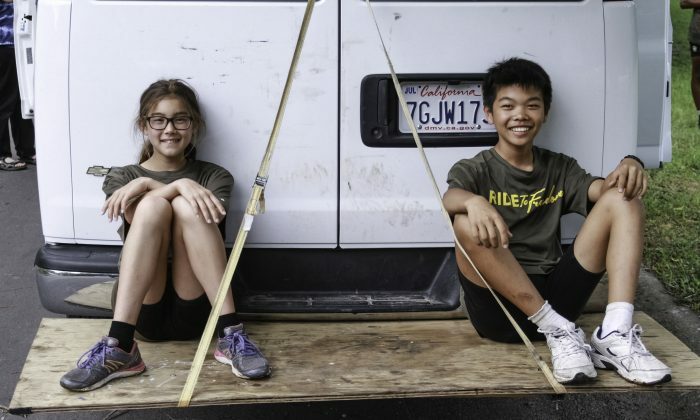 KANSAS CITY, Mo.—What can you say about a group of teens and preteens taking a 3,000 mile bicycle trek, called Ride2Freedom, to save five orphans? Remarkable, even heroic, perhaps? Coming from around the world and representing 15 different nations, the 25 riders started cycling on June 1 from Los Angeles. Their journey aims to raise awareness of the persecution of Falun Gong in the People’s Republic of China, which began in 1999. More specifically they aim to rescue five orphans, who have lost their parents due to the persecution. All of the children practice Falun Gong, a spiritual path that incorporates meditative exercises and adheres to the principles of truthfulness, compassion, and tolerance. What moves these youngsters to take their summer vacation and travel across the country? On day 27 of the trip, the Epoch Times caught up with Ride2Freedom in Kansas City to find out. Aila Verheijke, 11, represents Hong Kong and is the youngest of the riders. Originally from Hong Kong, she now lives in San Francisco. Aila considers this trek “a once in a lifetime chance” that she doesn’t want to miss. “It is very important that we raise awareness and save five orphans so they can have a happy life,” she said. For Tanner Gao, 13, the ride is a bit more personal. His parents were persecuted in China. Before he was born, his dad got taken away to a labor camp for two years. Then when he was 6, his mother was taken to a brainwashing camp for six months. His family moved to the U.S. to escape the persecution, he said. “I missed her, and I don’t want anyone else to feel that way,” he recalled. “I would feel really guilty if I miss this chance” to save the orphans, he explained. Starting in Los Angeles, the riders have rallied across the U.S. and in 45 days will reach Washington D.C., and then push on to New York City to address the U.N., according to Ride2Freedom’s website. I missed her, and I don’t want anyone else to feel that way. Averaging about 80 to 130 miles a day, they each cycle in one- to two-hour shifts before taking a break and riding in vehicles with family and supporters. It should be kept in mind that these riders have no professional biking experience, yet they are climbing mountains and crossing deserts, according to a press release. Thus, it’s not surprising that they have met some tough obstacles along the way. The hardest part for Ailia has been falling down. Some of the riders had wounds that looked pretty red and puffy. Tanner’s legs were covered in scabs from a fall. For Borong Tsai from Singapore, 15 this year, the hardest part of the journey was going through the Rockies. “Because I come from sea level, we were in 8,000 feet of elevation and I almost fainted,” he said. They’ve traveled through some terrifically hot and muggy days as well, with the highest temperature reading of 102 degrees in Kansas. But kids will be kids. The children enjoy themselves and make friends wherever they go. The most fun Tanner, who starts eighth grade this year, has had was when he was swimming. “We swam in the clearest lake in Kansas. It was a really hot day and you just rode and then you go swimming. It was a relief,” he said. Aila has most enjoyed getting to know the other cyclists and camping out together. Perhaps the most harrowing part of the journey is yet to come. The group will select a few riders to fly to China and bring back the orphans. Everyone can follow the ride on the Ride2Freedom website, the R2F Facebook page, on NTD Television, which will be streaming live daily from the road, and via Epoch Times. Ride2Freedom is 30 youths will bike 3000 miles across America to rescue children orphaned by the persecution of Falun Gong in China.